Every farmer and person from a rural community needs to watch this video and realise the consequences of what is coming upon Brexit. Farmers and food producers face “considerable turbulence” if the UK leaves the EU with no deal, Environment Secretary Michael Gove has said. He told the Oxford Farming Conference it was a “grim and inescapable fact” there would be tariffs on exports and new sanitary and other border checks. While “not perfect”, he said Theresa May’s Brexit deal would protect market access and provide economic certainty. But Labour said “basic legislation” was not in place to prepare for Brexit. And environmental campaigners said Mr Gove should set up an independent regulator to ensure that minimum standards to protect water, soil, wildlife and animal welfare are maintained. The UK is scheduled to leave the EU on 29 March, with MPs due to vote in the Commons in mid-January on the prime minister’s withdrawal bill. Urging MPs to support the PM’s deal, Mr Gove said it would ensure the UK left the Common Agricultural Policy but, at the same time, provide a smooth transition period for agriculture and guarantee continuous tariff-free and quota-free access to EU markets. From 2021, he said, the UK would be able to “largely diverge from EU regulation”, enabling it to pursue its land management priorities and invest in technology which the EU has “turned its back on”. “All of these are real gains that our departure from the EU can bring, but these real gains risk being undermined if we leave the EU without a deal,” he said. Mr Gove, a leading figure in the 2016 Leave campaign, rejected suggestions that warnings about the economic impact of a no-deal exit were being over-stated and another example of “Project Fear”. “No-one can be blithe or blase about the real impact on food producers in this country of leaving without a deal,” he said. It was a “grim and inescapable fact”, he said, that beef and lamb exports could face export tariffs of at least 40% if the UK defaulted to World Trade Organization rules, while standard tariffs of 11% could be levied on a host of agricultural products. “The combination of significant tariffs, where none exist now, friction and checks at the border, where none exist now, and the requirements to re-route or pay more for transport when current arrangements are frictionless, will all add to costs for producers,” he said. The government has guaranteed to pay subsidies to farmers at current EU levels until 2022. After that there will be a “transitional period” in England, with an increasing link between funds and maintaining “public goods”, such as access to the countryside and planting meadows. Mr Gove said these commitments offered farmers greater certainty than their EU competitors. But Conservative former minister Guto Bebb, who backs another Brexit referendum, said the proposed deal would leave “all the big questions unanswered”. “There is no kind of fantasy Brexit deal that can meet all the promises made to farmers or the rural economy,” he said. And Labour said Mr Gove’s vision for the future of farming was “irrelevant while basic legislation is not even in place and there are serious concerns about Defra’s preparedness for a no-deal scenario that would be devastating for farmers”. The National Farmers Union said an “orderly” Brexit was vital for the industry’s future prosperity and to fail to deliver that would be “catastrophic”. “That’s primarily because a lot of our input, 90% of our animal medicines and vaccines, chemicals and fertilisers, are produced in the EU,” its president Minette Batters said. 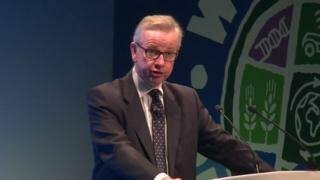 In his speech, Mr Gove insisted maintaining animal welfare and food safety was critical to the industry’s reputation and sustainability and the UK “must not barter them away in a short-term trade off”. The NFU is calling for “more than warm words” on the issue, with specific legislation to ensure the same standards are applied to imported food as home-grown produce. With many thanks to: BBC England (Politics) for the original story.